- We're sorry, this product is no longer available! Oxbow Organic Guinea Pig Food is specially-formulated to mirror the nutrition a guinea pig would find in its natural environment. Fortified with essential vitamins and chelated minerals, it contains a wholesome combination of organic ingredients, including high-fiber grass hay and essential nutrients to nourish your guinea pig the way nature designed. Oxbow is a great brand and makes good quality pellets for your Guinea pigs. 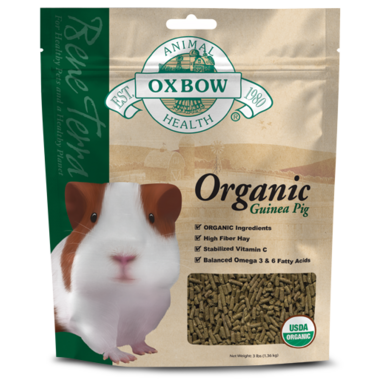 My pigs love this organic one and all other oxbow pellets !